Toronto. Girls night out. In desperate need of gas. And so, while at the gas pump in the wee hours of Saturday morning, Kate couldn't figure out why the heck I was laughing while filling up. 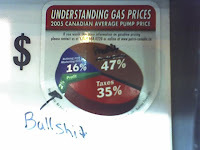 Until I redirected her attention to the pump where I guess someone was inclined to want to make a few corrections to the pie chart no doubt commissioned by the government. I couldn't resist not taking a picture. And as soon as the tank was filled, a truck pulls up for its nightly routine. That's a public worker sanitizing the garbage/recycling cans. I can tell you I feel a whole lot better knowing this takes place every night all over the city. The things that take place on Toronto streets when no one's watching! I have to say, this camera phone, courtesy of Hubby, sure is coming in handy. We creatures of comfort get satisfaction & contentment in the everyday familiar. So, when we're back in Toronto, I reckon a dose of my hometown familiarity is apt to make up for lost time. But there's one thing that's unfamiliar & uncomfortable in the big T(dot) this time around. Gas prices! Apparently, the Nanticoke refinery in Ontario was temporarily shut down due to a fire in February. This caused gas shortages all over Ontario, which only resulted in further price gouging. Gas prices rose to an all time high of a BUCK a litre (or when translated to Bermuda & US measurements about $3.78 CDN a gallon. While we took in this news in Feb, we figured this would blow over by the time our trip came around March end. Not so! The Nanticoke refinery is back online, but prices at Toronto's pumps have yet to see a decline. Add to that many gas stations are reportedly still out of gas & have been forced to shut down. While the government should be stepping in to relieve some of this pressure it's not about to for perhaps two reasons. About half of all gas earnings are directed to the government in the form of fuel tax - so the higher the price the more tax earnings for the government (and since when does any government not like more money flowing their way). The other reason might just be that the government is hoping the high gas prices will encourage more to turn to public transportation therefore alleviating traffic woes & smog that plagues Toronto. (Personally, it's reason #1 that's more plausible for when has any government been concerned about lining their policies for the good of the environment). Think this does not affect you? Mull on this: domestic & international flights taking off from Toronto will pass on their refueling costs which will show up on your airfare. The other harsh reality that many are facing is that these prices are being reported to be steady through the summer. For those of you who are not aware, summer is the season for weekend trips to the cottage up north, long drives across the border during long weekends & many road trips of the sort. So, you can see how this is going to be a problem. In Bermuda, I barely pay attention to our weekly gas expenditure, nonetheless I'm sure it's about less than $10 USD to fill up the scooter. Here in T (dot), however, I am definitely feeling the pinch. We've been driving around all over visiting family in my dad's fuel efficient Tracker & despite this, a temporary $10.00 gas fill up barely registers on the fuel gage, where before it was moderately enough to feed the hungry auto beast. It's doubly good when you're able to celebrate your birthday with your family & friends back home - which is what I did today. Yes, we are back in T. for a week. It's not as warm as Bermuda but it's not that bad either. My mom's been complaining that the cloudy weather has been a like persistent cold that will not let up anytime soon. But I say we brought the warm Bermuda weather with us & sunshine was not guaranteed. Now I am all set to use my gift certificates & shop the town at my favourite stores so I can stock up on this season's styles. But Lord knows I am running out of closet space. I came to a realization today as I was cleaning the walls of our place. Cleaning the walls you say? Yes, sometimes a necessity depending on where you live & with what kind of paint your walls are adorned with. Bermuda's damp humid climate causes a problem for many, especially in the winter. Winter months are not supposed to be accompanied with high levels of humidity but unfortunately for this island, it does. This at times affects the walls inside your home, causing condensation to form & along with the dust in the air, it makes for an interesting tinge. The best way to get rid of this unwelcome gradual change is a good spraying of equal parts water & bleach. A few friends have told me that this has to be done to their ceilings not their walls, but I wondered why I had to render this treatment to my walls as well. Well, here's my epiphany: Ordinarily walls are painted with a semi-gloss to a high gloss paint (which is great when you have kids - easy cleanup). The higher the gloss the more the shine. On the opposite side of the spectrum having flat or eggshell paint on your walls is a magnet for permanent fingerprints & existence of every day living. Ceilings are, however, always painted with flat paint base. Besides, who'd want to look up at a semi shiny ceiling anyway. Well at our place (which I love for many things including its ocean view) our walls are painted with a flat paint finish - a magnet for condensation & dust during high humidity months. So, even if you do run your dehumidifier, be prepared to bleach your walls once in a while. That is if you have white walls with a flat paint finish. But I guarantee your ceiling will need a spray of bleach, at least once in a while. Ordinarily, I abhor white walls as I am all about colour but I have learned to live with the white that surrounds me. The humidity & its effect is the nature of Bermuda's climate, just be prepared. Now my walls sparkle & I feel good, save for the lingering 'scent' of bleach in the air. Cricket update! Bermuda lost against India today. Apparently, India scored 431 runs & set a record of the most runs scored in a match. Ok, we all knew who was going to win this match. Even the local kids down the street were with me on this one! But, had India lost against Bermuda, I would not have been able to show my face around here. Not because India's better & Bermuda's not (we are still talking about cricket teams). It's because Bermuda is a relative newcomer to the international cricket scene as a team. India's team has far more experience under its belt, having played at many many cup matches, so losing to Bermuda would have NOT been an option & oh! so shameful. But the one thing, I noticed about Bermuda is even though their team lost the match, the local news made it a point to highlight all the positives about Bermuda's play in the match today. And highlight it did, for a good few minutes & with such gusto. Watching the news, you would have thought Bermuda actually won the match. For a split second there it even threw me off, left me scratching my head & wondering: I thought Bermuda lost?!? Yet, isn't that such an admirable thing to see - that your country cares not if you win or lose but how you play the game! The Gibbs Hill Lighthouse is Bermuda's famous most landmark. Built in 1844, it's the oldest iron cast lighthouse in the world. Climbing up its 185 steps will yield you spectacular views of most of the island. While the lighthouse stands tall at 117 feet, the hill it stands on is about 245 feet above sea level. For the past little while the steps leading to the top of the lighthouse was under construction but not anymore, giving you no excuse to make that trek up to the top. And when you're all tuckered out, the Lighthouse Tearoom makes for an excellent stopover be it breakfast or lunch. The lighthouse also has a 1,000 watt bulb along with a trough of 1,200 pounds of mercury that the bulb sits & revolves in. So, when you're at the top, look out for it. This may mean climbing up the steps reserved for the maintenance personnel, but no one really pays attention to the signs anyway. However, I was too engrossed with the fabulous island view. So I missed it. Twice. Although, next time I will take a moment to pay particular attention to the mercury & the mega watt bulb. It's not often that you get to see the inner workings of a lighthouse. Cricket fever is everywhere! Thursday's match between Sri Lanka & Bermuda yeilded a win for Sri Lanka. The only reason I know this is because friends were talking about it, asking me if I watched it. Umm no. But maybe I should, eh ? I called my maternal grandmother's brother (Uncle Lewis) today. He's the big 75 today & the only one left from his generation. He's also the only 75 year old I know who still rids his scooter! The entire family ganged up on him with birthday wishes from the seven countries that we're spread out in. During our conversation he told me he's been watching the cricket cup matches. Of course, being born & brought up in India & still residing there, he's ought to be an avid cricket fan. He said Bermuda's been playing pretty well (which I don't know much about). But I have to say that definitely put Bermuda on the map. I am sure more are aware now of where Bermuda's proximity is to the rest of the world & they'll probably be amazed - tiny island in the middle of nowhere. March break is an exciting time for kids & their parents as they leave the still persistent winter & head to warmer destinations such as Florida, the Caribbean & Bermuda for a week of fun in the sun. So, the island has had quite a few March breakers this week. Whilst at the beach, we noticed a some college students enjoying the fine weather we've been having. Dying to go in the water but hesitant to do so, at first anyway. But they did, eventually, even though the water was not warm enough to warrant a swim in Bermuda's beautiful blue. Hey, it may be warm enough for them but it's definitely not warm enough for us residents. May 24th, also known as Bermuda Day is the official day that Bermudian men don on their Bermuda shorts for the rest of the summer. It's also after that date that most Bermudians they tend to venture out into the water. Hubby & I don't wait that long, though. The water is too tempting, beckoning us at every turn on South Road. So, we tend to do a couple of tests runs before the 24th & might I say it works out just fine, every time! As of Monday, it's been two years for us here in beautiful Bermuda. Neither of us noticed the anniversary date & I don't know how that happened. But in taking a moment now to look back at the past, I remember the most pressing thing that we were worried about when we first landed - finding a decent apartment & having about a month to do it in. Since Hubby had already started his then new job two days later, the onus was on me. I had to be proactive as soon as e-moo posted their rentals for the day because the good ones would be snatched up before I'd even had time to blink. Due to the huge demand, landlords are able to be picky & choosy about whom they want renting their space. Words like 'Professional non-smoking couple' are ones that landlords like to hear. A question we'd often get asked is if we're married. You see as Bermudians are very religious, there are some that refuse to rent to unmarried couples. Being betrothed does not count either. Of the 10 apartments we looked at, only two ventured to ask about our marital status. Two that I can remember. However, if you have pets it is difficult to find a one bedroom rental. Dogs or cats, it doesn't matter. You will more than likely have to rent a two bedroom house which can cost an upwards of $3,000 USD per month or houseshare. So, if you're planning on bringing the beloved canine or feline family member, I'd suggest you leave it behind. The move & the transition will be a lot less aggravating for all parties involved, meaning you & the pet. It's not so easy for your pet to adjust to a new place, a new sub tropic environment especially while you are away at work for the better part of the day. Friends have also told me that dogs here catch fleas fairly easily & the vet visits here don't come cheap if your pooch or kitty needs to make a trip to the doctor. For the most part, however, if you do get a place with an ocean view, it's a good thing. For those of you looking to move to Bermuda & would like to have a clearer picture of the rental market, here's the link. Good Luck & Happy Hunting! Maternity leave is so vital & essential to new parents, especially to new mothers. But this varies among countries around the world. Maternity leave in the Middle East is about anywhere from 45 days or more depending on the country. I remember this being an issue with my aunts when I was growing up. They'd complain that 45 days was not enough. Course not! What's 45 days? Bermuda offers three months maternity leave with pay across the board. I've heard of a generous few companies that offer even more trying to stay in line with their parent companies. But this is rare. Depending on the nature of the job, most companies are reluctant to offer any additional maternity leave, unpaid as it may be. This option, if it were available, is tricky for expats because of the time limit issues with their work permits. The three month maternity leave can also come as a surprise for some Canadian & Brit expats expecting it to be on the same playing field as their home country. For many American expats, however, paid maternity leave is a positive & significant benefit than compared to their homeland. Surprisingly, America is the only industrialized first world country that does not offer paid maternity leave to its employees. While that is standard across the board, there are some corporations that make exceptions. For the most part, employers are unwilling to compensate new mothers or fathers for this critical time off. They believe that people should be financially responsible, prepared & not depend on the government or their employers for parental leave of this sort. This coming from America! Shocking eh, especially considering so many third world African nations actually offer paid maternity leave to its new mothers. Perhaps it is for this reason that Americans (& Bermudians too) are shocked when they find out Canada's maternity leave period is slated at a year with the option available to either parent. That it's only compensated at 55% of regular pay doesn't seem to phase anyone a bit. Who cares they say - one year is amazing just to be able to stay at home with your baby & get paid for it even if it's only 55%. Fair enough. No complaints here. However, if they're impressed with Canada's maternity leave plan, they'd be even more so with Sweden & Norway, who offer paid maternity leave for 18 months. Bulgaria tops the list offering its working employees TWO years paid maternity leave with the option of an additional year of unpaid leave. Now that's sweet! I just discovered that Blogger lets me transliterate in Hindi! I think it's one of the only languages available at the moment. At first I couldn't fathom why they chose Hindi as one of their first. But then I remembered a couple of things. Hindi evolved from an ancient Indian language named Sanskrit (the Indian equivalent of Latin). Sanskrit is the language known to be most compatible with computers. Ta Da! That & Hindi is the second most language spoken language in the world about 333 million. Even the Arabs in Dubai speak Hindi, due to the large presence of Indian expats. Anyway, just when I thought Google could not get any better! Of course, at first I was really excited about the transliteration feature. I thought I could put my dormant Hindi language skills to some good use & sharpen my brain in the process. But it's not as easy as I thought it would be. I have to type what I intend to get across phonetically in English. Blogger then magically transliterates words into Hindi. There's a few obstacles in my path. Because Hindi is a third language for me & even though one that I am fluent in, my style of writing would not be the same as it was in English. Besides, other than some family & friends who know the language, who'd read it anyway? And what the heck would I write about? In other interesting news, Canadian singer Avril Lavigne has released her latest single, Girlfriend, in eight languages (Mandarin, Japanese, Spanish, French, German, Italian and Portuguese). While she does not speak a second language she spent hours studying the various languages to get her song right. She stopped the buck at Hindi. Apparently, the language & the rhythm didn't match & that after Portuguese, Hindi is the hardest language to learn. Some Indians are not happy. They feel they've been shafted yet again. Ha Ha Seriously? I can't help but laugh. You know Bollywood (the Indian film industry) will rip that entire song, as it's been known to do to many other popular Western tunes. Hang in there my fellow Indians, you'll not only get the entire song, but probably soon. It's definitely challenging. For those of you who would like to read more, check out my new addition. It's all in layman terms, nothing fancy or flowery & probably with a ton of errors. I hope to get better with each passing post. The 2007 World Cup Cricket match will be held in the West Indies this year from March 13th - April 18th & Bermuda is one of the countries that's slated to participate. For the first time as I know it, Bermuda is actually offering direct flights to the Caribbean (which is not the norm). Many are making plans to travel to the West Indies & everyone's excited as they cheer on hoping Bermuda will win. Hey, you never know! America does not understand the fascination & the hype that goes with cricket, but then again I am sure that the Commonwealth countries reciprocate those sentiments when it comes to America & baseball. Bermudians love cricket naturally - a love that they have inherited from the mother land, England. I used to be in the know about cricket, but after moving to Canada, baseball pretty much took over. And even though Canada does have its own cricket team, I have long since forgotten how cricket works. While I do remember the rudimentary of rules, I'd probably draw a blank if you were to ask me anything specific. However, the commentary & plays of a cricket match, any cricket match, takes me back to my childhood days. Lazy sunny days where the Cricket Cup Match is all that anyone would be talking about. My grandparents & parents were ever so engrossed in the matches that would last the entire day. India's favourite country to beat would be Pakistan. Oh! those matches would yield excitement like no other. I'm sure many kids here are experiencing the same cricket fever that I did. Memories being created as families get together to watch Bermuda take on other countries. Who would Bermuda love to beat? Maybe England? If I were into cricket now, who would I root for? India, Canada or Bermuda? In further cricket news, Nike India has unveiled its new ad. What's interesting is that the jingle is not in the official Indian language of Hindi. It's in Konkani - a mixture of a couple of Indian dialects & bits of Portuguese - spoken by Goans who originate from the previously Portuguese ruled Goa. It's also the second language I learned after English & it's so neat that it's the chosen one for the jingle. And while I'd translate the jingle that reflects the Goan style of music, I am a bit lazy to do so at this point. But enjoy! You must all know by now how much I love fish, especially the tropical kind. Well, presenting my very own & first Bermuda's Marine Life Slideshow. Enjoy! This link is also posted on the left under Bermuda Sun Links. Keep checking for more slide shows of all things Bermudian. Except for my years in Canada, I grew up with the sand at my feet, but never with sand so pretty as Bermuda's. And I say pretty because it's pink. It's not the coral that's the contributor, but a single celled animal known as foram (or the red foraminifier to be exact), pink in colour & growing on the underside of rocks. Once the foram dies, its pink skeleton is eroded & washed away to join the ranks of other particles like snails, shells & white sand. It is the foram that gives Bermuda's sand its pink hue & sand of this caliber is quite rare. Scotland is reported to be the only other place in the world with sand similar to Bermuda's. While not all of Bermuda's beaches sport this pink hue, most do, especially at Warwick Bay (big chunks of pink there) but the sand all over the island is soft on your feet. And the government does a pretty good job of keeping this sand clean. During the summer months the sand is cleaned regularly of seaweed & litter. We found this lone little fella at John Smith's Bay. He couldn't decide which direction to head into but he was camouflaged quite well & content sitting pretty in pink. Except for those yellow legs that give him away! Kopi is the Indonesian word for coffee. Luwak is the Indonesian word for the Civet cat. What's interesting is when these two words are combined to form a rare, very expensive & exclusive gourmet coffee that's making it's way into the world. Adverts for this coffee runs along the lines of 'From Cat to Cup' or 'The Purr-fect Cup'. But all play on words aside, why would an animal be associated with coffee? The Luwak's favourite food is the coffee cherry which it ingests, bean and all. Apparently it's the enzymes in the Luwak's digestive system that are absorbed by the coffee bean giving it its distinct flavour. Once the process is completed, the bean is excreted, the only way it can naturally, it's then collected by farmers. Once cleaned of the Luwak's feces (you see where I'm going with this), the bean is then roasted & ground for all you gourmet coffee lovers to enjoy. Are you kidding me? If it's going to come out of an animal's something, it should be priced next to nothing. Either that or someone's got to make this animal work overtime to make the laws of supply & demand work in our favour. Needless to say, I am no coffee drinker, but if I were, I'd certainly not want my coffee that way. The bean could be bleached for all I care, it still wouldn't make me change my mind. And I care not for how exclusive its taste is. The restaurant didn't bother to disclose further facts on how the Luwak was completely involved in the process of this coffee bean. Oh wait, I know why. Perhaps that mere fact would be a deterrent to customers actually trying out this expensive cup. It would make people's imaginations start to wander. Hmm what is that unique taste they may ask. Or the thought that they hope those beans were cleaned down really good. Just you wait - some big shot is going to try out this coffee, find out the hows & whys later & waltz in to sue their pants off. But then again I've heard you can't really sue anyone here in Bermuda. We've had some pretty decent weather - sunny days and all that. It's been getting darker later too & with the DST change next week, it's about to get better. While winter in Bermuda seems to be in full force in the short month of February, somehow it's just feels like it's the longest month there is. But bang March has rolled around & it seems like there's been a sudden unveiling from a state of hibernation. More like - that's it? Winter's done? Well, about time! That's what I've been feeling the last couple of days. My brother, Newt & his co-workers have been here on the island this week for a business meeting. With work getting in the way & of what little they have been able to see so far, they were awed. It's been interesting seeing the island through their eyes. Even though it's been cooler than normal, with Bermudians stating that they have not known it to be this cold, it's a welcome change for these visitors from the T(.). They insist Bermuda is anything but cold. You see, it's only when you've got visitors from the cold white north that you realize there is a colder world out there, one that you may have temporarily forgotten about, but ta da you get family friendly reminders every so often. So, I had to take a step back to see what Newt & company saw. I had to first picture myself from their point of origin. Toronto with it's bare landscape save for the evergreen trees, streets kissed with melting snow giving rise to the unwelcome slush, the below zero temperatures at night & the most recent yet another snowstorm definitely makes Bermuda a welcome change. In contrast, we have Bermuda with it's rich foliage year round, blue skies when they're not threatening & awesome aqua hues when the sun decides to shine down. Yeah, I guess I have a lot to be thankful for. And I am. At one point, Newt looks at me & says: So you live here, huh? Obviously, a rhetorical question. Yet all I could do was smile, shrug & answer in the affirmative. Not because I was taking it for granted but because I did not want to rub it in, for you see, he still has to go back home to Toronto in a few days. Well, not before he stays back to enjoy the island with Hubby & I, while his colleagues leave tomorrow as scheduled. Well, ain't the boy just plain lucky!